"Fall" redirects here. For the article about a character's descent in midair, see falling speed. Mario gets KO'd by Link. A KO, short for knock-out or knock-off, commonly known as a death or a kill or even a finishing blow by Stamina Mode, is the term used to describe the situation where a player is launched beyond the stage's blast lines by the opponent's actions. The KO'd player is sent to a revival platform to re-enter the match. Losing all HP in Stamina Mode results in a KO without crossing a blast line, and some attacks and hazards can cause instant KOs without the target crossing the blast line or being launched at all. All characters have the same KO explosion, namely a gigantic colorful blast that extends in the direction the victim was KO'd, in the color of the player's port: Player One's explosion is red, Player Two's is blue, CPUs are grey, and so on. Only two characters have slightly different KO explosions, Mega Man and Luma: Mega Man will split up into orbs the color of his costume (alongside the normal explosion), like he does when he dies in the Mega Man series (they will sometimes not appear if many Mega Mans are KO'd at the same time), while Luma's explosion is smaller and creates colorful stars. A One-hit KO occurs when the target suffers a KO even when their damage is at 0%. In a Time match, the KO'd player loses a point, while the player who made the KO gains a point. In Super Smash Bros., the score indicators are present in both Timed and Stock matches, but are meaningless in the latter. In later games, the indicators are absent for Stock matches. Single-player: A Continue or a Game Over (the latter if the player doesn't have enough coins in Super Smash Bros. Melee and Super Smash Bros. Brawl or chooses not to continue). Multiplayer: Removal from the rest of the match. In a team match, the player can "borrow" a stock from an ally. In a Coin Battle, KO'd players lose half their smash coins, rounded down. Brawl prevents a player from losing more than 100 smash coins at once. The lost coinage flies into play if the KO was made off the side. In a Bonus match (Melee only), a KO will earn the player 500 points, while a fall will subtract 500 points. In the Subspace Emissary, the next character in the lineup is loaded and teleported into play without a revival platform. One stock is also lost. Characters can also be KO'd in the Subspace Emissary if they are crushed by moving walls, ceilings, or floors. In Super Smash Bros. and Melee, each character has a "KO property" which starts out empty. When characters are hit by any attack (be it a physical attack, a projectile, an item, etc. ), their KO property is set to match whoever made the hit. Stage elements do not change the KO property. The KO property is reset once a character lands on the ground and is no longer moving as a result of the attack's knockback. When the character is KO'd, the KO goes to whoever matches the KO property. If the property is empty, the KO counts as a self-destruct. In simple terms, it goes to whoever made the last hit. However, this format was altered for Super Smash Bros. Brawl. In Brawl, a character's KO property is only reset 3 minutes after landing on the ground. This essentially means that a character must refrain from being hit for 3 minutes for a self-destruct to actually count as such; otherwise a self-destruct will be credited as another player's KO. While this was possibly implemented to avoid griefing in online matches (by self-destructing simply to deprive other players of points), in reality its main effect is giving other players illegitimate points, as it's clear that jumping off the edge a few seconds after successfully recovering is not a KO. There are exceptions, however, particularly during most Final Smashes. 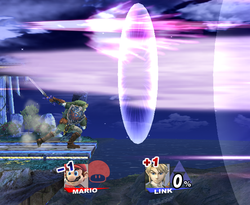 If players jump off the stage during a Final Smash such as Zero Laser, then, unless someone else hit them before landing, it will count towards the user of the Final Smash, instead of the last one to hit them (Samus in this case). Moreover, getting KO'd during the usage of certain Final Smashes such as Giga Bowser will result in a self-destruct instead of a KO, even if players have been damaged by opponents previously. Characters with invincibility from a Starman will also self-destruct instead of being KO'd. Super Smash Bros. 4 appears to retain the Brawl system, but with one notable change: in matches of two players, any self-destructs are also credited as KOs for the opponent. For example, if a player has been KO'd once and has one self-destruct, the opponent will be credited with two KOs. This change only affects KO-based statistics; it has no real effect on who wins the match. A cannon resets the KO property as well. For example, if a player got knocked into a cannon on a custom stage and dies, because the cannon shoots them past the blast line, it will count as an SD. In addition to the colorful KO blast, every fighter makes a loud, distinct vocal sound upon being KO'd, though there are some exceptions who are silent due to lacking voice lines. Throughout the series, these exceptions are Samus (Brawl onwards), Mr. Game and Watch (not in Melee), Olimar, Duck Hunt, Mega Man (excluding "8-bit explosion" sound effects), Pac-Man, Villager and the Mii Fighters. Every fighter in Brawl, Smash 4 and Ultimate possesses two KO sounds, with the second being rarer and often a short phrase or line. In SSB4, there are a handful of characters with only one KO scream, which are Jigglypuff (has two in Japanese), Roy, Mewtwo and Bayonetta. StreetSmash gives Pac-Man a KO sound not heard normally. Unlike previous games, in Ultimate, if a character is on their last stock and is KO'd, their KO voice clip will not play (though some characters' KO voice clips will very briefly play, such as Peach's, Wario's and Incineroar's). Wii Fit Trainer (Female): "Oops!" In Super Smash Bros., the sound effect that plays for the blast KO uses the same "ping!" sound effect from certain moves or items, albeit slowed down significantly. In SSB4 and Ultimate, should a fighter be sent flying when extremely damaged (such as at 999%), their KO scream may not play and will be replaced by one of the fighter's "hurt" voice lines or nothing at all. This happens more frequently if the fighter is frozen, or if a character is hit right by a blast line. In Ultimate, while the Screen KO uses the Blast KO effect at the end of the animation, Mega Man will not split up into orbs. This page was last edited on April 19, 2019, at 17:38.